Today at around sundown, settlers from the illegal Israeli settlement of Yitzhar set fire to the ground in the Salman valley in Burin. 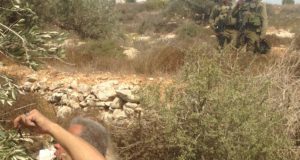 The fire was in the same location where two ISMers and two members of the Michigan Peace Team (MPT) had been picking olives only hours before in the Najjar family groves. The fire service attended and with the help of around 10-15 villagers the fire was finally put out after about 90 minutes. The inability of the fire truck to reach that part of the slope meant that the fire needed to be put out by beating it down with shovels. While it burned it devastated both upper slopes of the valley and destroyed some olive trees in the valley as well as at least one tree on the upper slope belonging to the Najjar family. 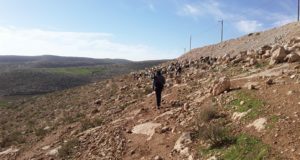 This small village of approximately 3,000 people deal with a constant threat of settler attacks and Israeli army harassment. Two illegal settlements and one illegal outpost surround Burin: Yitzhar, Bracha, and Givt Arousa. The residents of these illegal colonies make it clear that they will do whatever it takes to force the Palestinians out of their homes. 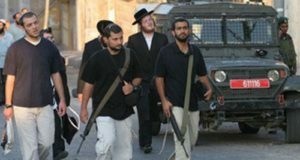 Their criminal acts range from burning olive trees, to shooting home made rockets at the village. In 2011, approximately 4000 trees were destroyed, burned and uprooted, by the settlers’ violence.